This groom has an amazing mustache. And his best man seems to like it quite a bit. 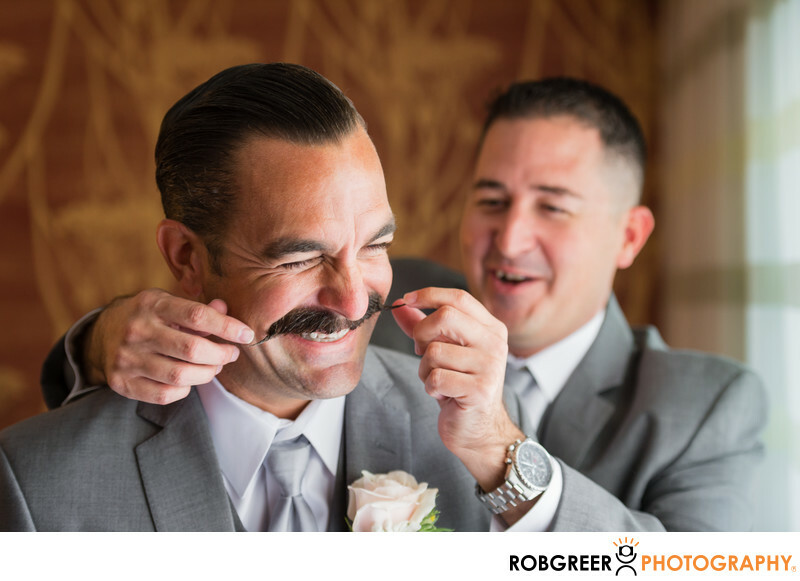 The bridegroom for this wedding got ready at the Torrance Marriott, a typical hotel like any other you might find anywhere. However, I would contend that these photographs are anything but typical. For me, a great photograph tells many stories. For this image, the story is that the groom is having a great time and lots of fun on his wedding day. It also speaks to the relationship between the best man and the groom and the playful nature and trust they haven't each other. And of course it also speaks to the ridiculously cool mustache exported by the groom. Although this photograph may appear to be a perfectly candid moment, I must be honest and mentioned that I set the stage for this image and I encouraged it to occur. Many clients who visit with me will mention that my photography appears to be quite candid. And that is the case for some of my images in my wedding photography portfolio. However, in other cases, I like to stack the deck to ensure that I achieve the best wedding photographs possible. In the case of the Torrance Marriott, I asked the groom to get dressed near the window where the light was best in his room. When it was time for him to put on his jacket, I asked the best man to help him with it. And that request put the best man in a great position to be photographed complementing the groom. As for the handlebar mustache twirl, it's quite likely that I suggested that the best man take the mustache for spin. This is the result. 1/80; f/4.0; ISO 1000; 90.0 mm.